Sun or shade? With a louvered roof it’s your choice. 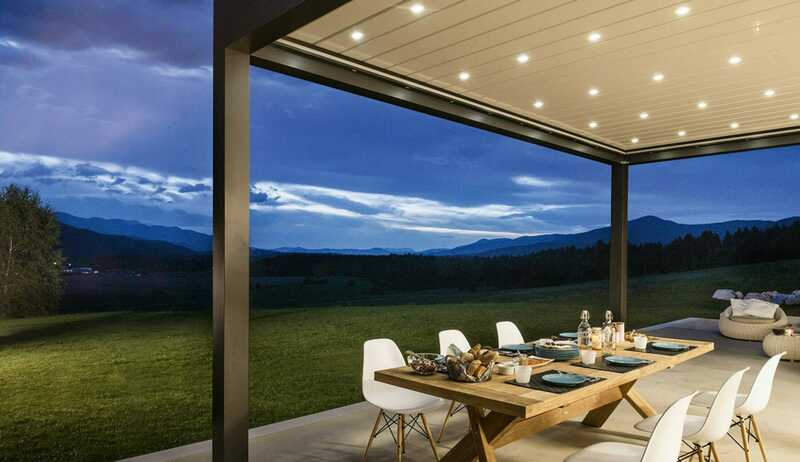 Although you can’t control the weather you can now be in charge of how much time you spend outside thanks to our Italian designed louvered roofs. 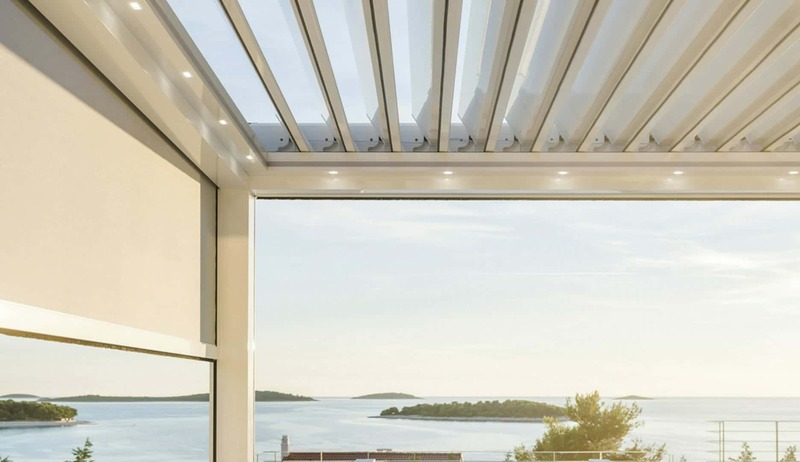 Being fully automated allows you to twist the louvers in the roof to allow as much light, or as much shade, as you want, covering your outdoor space at the press of a button. 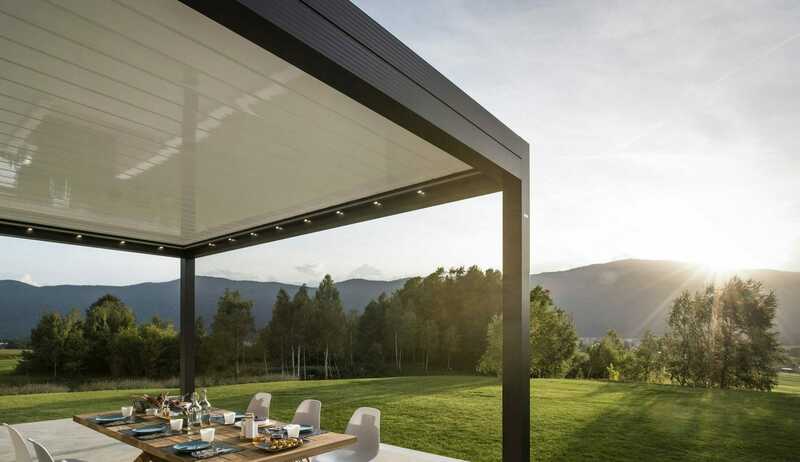 Our louvered roofs boast numerous technical innovations including a unique 135 degrees twist motion, which allows the individual louvre blades to remain in contact with the frame throughout the entire motion. 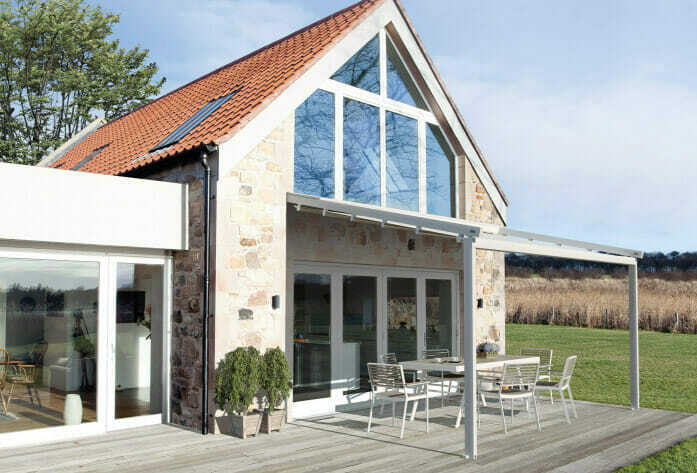 This patented opening system, that we call ‘Twist Motion’, makes our louvered roofs stand out for their innovative design that is efficient and reliable. This design eliminates any light gaps, unsightly gutters or water leaks. 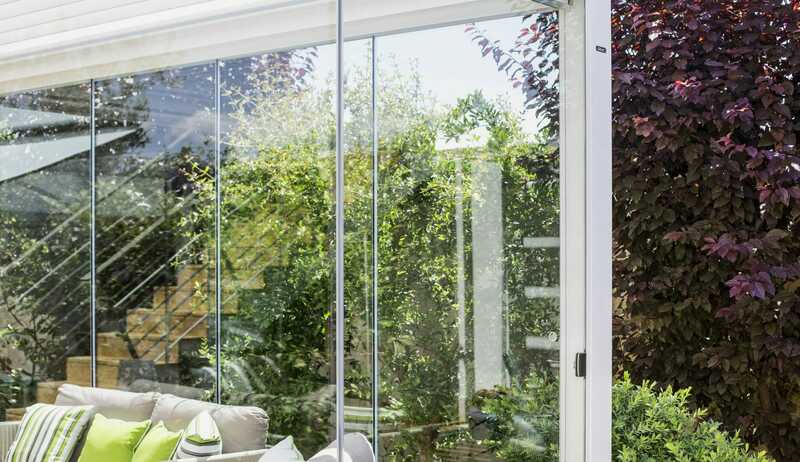 Regulating the blade allows you to moderate the sunlight that filters into the area underneath, giving full control of the microclimate within your garden, with the simple touch of a button. Benefit from quiet, convenient and refreshingly cool ventilation by taking full control of the integrated motorised system. 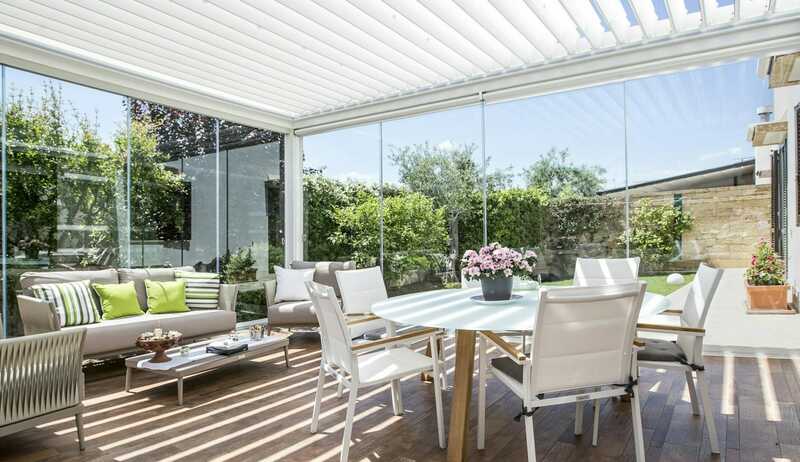 Our louvered roofs are able to seamlessly manoeuvre the tilted slats from 0 to 135 degree angle to quickly and easily ventilate your sheltered patio or garden space. The beauty about our louvered roofs is the ability to quickly and easily configure them to let in the amount of protection you desire. With the click of a button you can either enjoy the sun well into the evening or shut out the weather’s extremities. 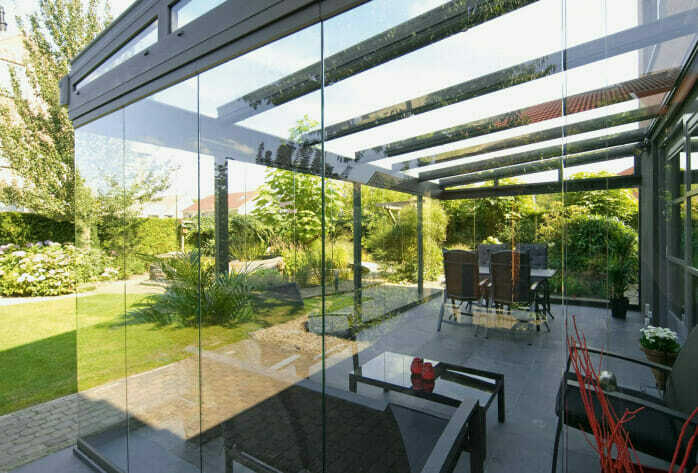 Relax and enjoy even the most isolated pockets of your garden as our louvered roofs are totally freestanding making installation achievable and creating unique expanses of space you to revel in. Does it take long to install a Louvered roof? Louvered roofs which are also known as bioclimatic roofs take 1 – 2 days to install dependant on the size. If side glazing and shades are purchased this may add an addition day to the installation in order to make sure we achieve a first class installation. Do Louvered roofs require planning permission? Can I add doors to my bioclimatic roof? Our bioclimatic roofs are modular in design meaning that glass sliding panel, side shades, lighting, & heating can all be added over time to make you louvered roof into a enclosed room for all year round use. How do you operate a louvered roof? Very simply via a hand held remote. Our Louvered roofs have 3 pre-defined positions and can also me manually adjusted to any position in between. This give great control of light and shade under your louvered roof which are also commonly known as bioclimatic roofs. What is a Bioclimatic Roof? 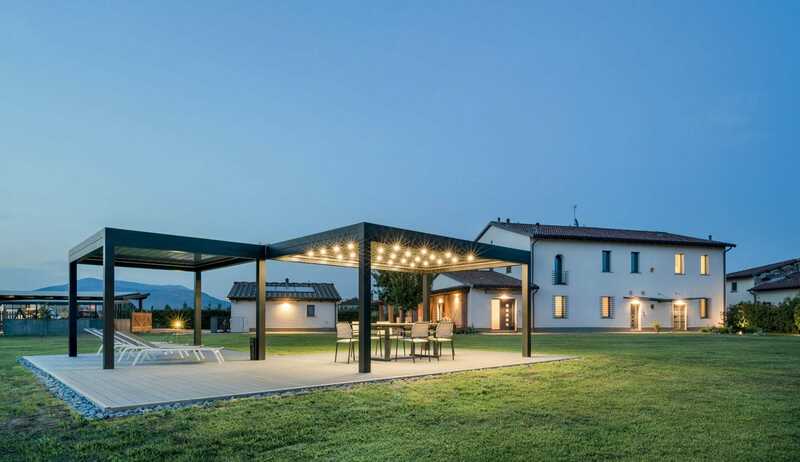 Bioclimatic roofs also known as louvered roofs and louvered pergolas offer a versatile way of using your outdoor spaces by combining adjustable rotating louvers with stylish and minimal side glazing and integrated screens. Our louvers roofs can be installed against a wall or totally free-standing louvered pergola dependant on your specific requires. So if you want a shaded area outside your back door or an area at the bottom of your garden away from your home we have a solution.